I looked up Weidenfeld and Nicolson, the publishers of this book, on Twitter and they say they ‘specialise in exceptional fiction and non-fiction‘. 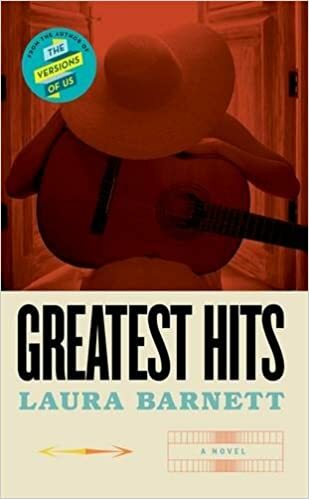 I think it is fair to say that Laura Barnett’s Greatest Hits comes into the category of exceptional fiction. I loved the author’s debut work, The Versions of Us, but think I may like this one even more. Now you are going to have to wait a while for this as it’s not published till June, but trust me it will be worth the wait. Retired and reclusive singer Cass Wheeler is putting together songs for a Greatest Hits album. As she listens to her songs as she tries to select them, she looks back on her career and reflects on her life. She has written hundreds of songs, had a eventful life, experienced love and loss and stopped singing ten years ago after a personal tragedy struck. Each of the chapters of the book begins with the lyrics of one of Cass’s songs and mentions when it was written, which album it appeared on (if any) and who was involved in the production. An album of the songs will be released at the same time as the book, with singer-songwriter Kathryn Williams bringing Cass’s songs to life. It’s a really intriguing concept and I’m looking forward to hearing the songs. Cass Wheeler is a wonderful character. The way her story is written going right back to her difficult childhood, following her singing career, her love life, motherhood and the sad losses in her life all helps to make her a fully rounded person. In fact she is such a strong believable character that it felt as though I was reading the biography of a real singer, rather than the story of a fictional character. Greatest Hits is exactly the kind of book I enjoy. It moves effortlessly between past and present hinting at and revealing a little of what happened as the story progresses. Cass was a character I totally believed in and I so enjoyed reading her story. Even though she had known much sadness in her life, she had also known much joy and love and lived a full life. There were other terrific characters in the book too notably Cass’s Aunt Lily, her assistant and friend Kim, Ivor her partner both musically and romantically, and her supportive friend Johnny. There were a lot of characters who moved in and out of Cass’s life particularly in the music industry and I did on occasion lose track of who was who especially if they only made brief appearances but I’m sure that’s down to my poor memory rather than any fault on the part of the author. Greatest Hits is a book which I am sure will be a huge hit (pun completely intended!) when it’s released. It’s a book to lose yourself in as, along with Cass, you relive her life through her music and memories. It’s a story about loving and losing and coming to terms with your past and is full of emotional highs and lows. Cass Wheeler – a British singer-songwriter, hugely successful since the early 70s, whose sudden disappearance from the music has been the subject of intense speculation among her fans – is in the studio that adjoins her home, taking a journey back into her past. Her task is to choose sixteen songs from among the hundreds she has written since her early teens, for a uniquely personal Greatest Hits record, describing the arc of her life through song. It has been over a decade since Cass last put out an album; ten years since a tragedy catapulted her into a breakdown. In the course of this one day – both ordinary and extraordinary – each song Cass plays sets off a chain of memories, leading us deep into her past, and into the creative impulse that has underpinned her work. This is the story of a life – of highs and lows, love and separation, success and failure. Of what it is to live a fulfilled life, and how to make peace with our mistakes. This sounds like my kind of book, will put it on my Amazon wish list. Great review, thanks Joanne. One of these arrived for me this week and now I’m even more excited to read it! It’s fabulous – hope you enjoy it as much as I did.